Timberland manager Pope Resources announced today it would be paying its second-quarter distribution of $0.45 per unit, the same rate it paid for the last four quarters after it raised the payout from $0.35 per unit. The board of directors said the quarterly distribution is payable on June 14 to the holders of record at the close of business on May 29. Pope has made a distribution virtually every quarter since 1997 and before that it made annual distributions for five straight years. No distributions were made in the first or second quarters of 2002 or for the full year of 2001. The regular distribution payment equates to a $1.80-per-share annual dividend yielding 2.9% based on the closing price of Pope Resources' stock on May 8. 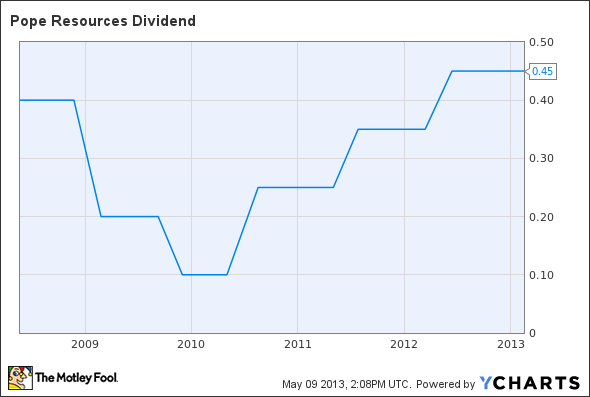 POPE Dividend data by YCharts. The article Pope Resources Keeps Distribution Steady at $0.45 originally appeared on Fool.com. Fool contributor Rich Duprey has no position in any stocks mentioned. The Motley Fool has no position in any of the stocks mentioned. Try any of our Foolish newsletter services free for 30 days. We Fools may not all hold the same opinions, but we all believe that considering a diverse range of insights makes us better investors. The Motley Fool has a disclosure policy.